By Caryn Rose. Eighteen days, five countries, and seven concerts: this was how long-time Springsteen chronicler and veteran Backstreets contributor Caryn Rose spent her summer vacation in 2012, following the Wrecking Ball tour from Paris to Prague to Vienna to London to Dublin. 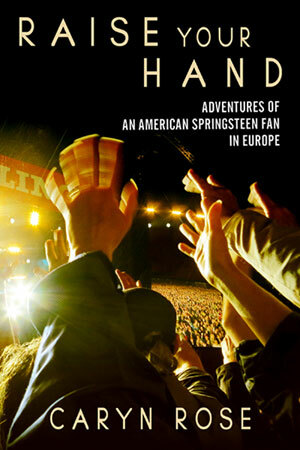 You've read her reports from those shows here on Backstreets.com; if you enjoyed her writing, we highly recommend her new book about the experience, Raise Your Hand: Adventures of an American Springsteen Fan in Europe. Part travelogue and part rock 'n' roll love letter, Raise Your Hand has Rose taking you with her every step of the way: queuing in the rain, sleeping on the sidewalk, and watching Paul McCartney from the front row in London. Previously available only as a digital eBook, we're pleased to be able to offer Raise Your Hand in physical form. Softcover, 138 pages including a sample first novel of Rose's novel, B-sides and Broken Hearts.